Greece is facing an uncertain future as a defection from the coalition government leaves it with a tiny majority in parliament. The smallest party in Greece's ruling coalition quit the government Friday, throwing the country back into political turmoil as it struggles to keep an international bailout deal on track. The defection was triggered by a dispute over the government's decision to close state broadcaster ERT last week and leaves the coalition with just a three-seat majority in parliament. That could make it more difficult to pass future economic reforms required as a condition of the rescue by the EU and International Monetary Fund. Investors were spooked by the political fallout, sending Greek stocks down by more than 6% and yields on government bonds higher. The 10-year yield has shot up to nearly 11% from just over 8% a month ago. Greece shut down ERT -- which employed roughly 2,700 employees -- in a move to meet government commitments to shed 15,000 public-sector jobs by the end of 2014. It intends to establish a new, much smaller, state broadcaster in its place. Cutting public-sector jobs and introducing economic reforms is part of the conditions laid out for Greece in its international rescue package by eurozone partners and the International Monetary Fund. 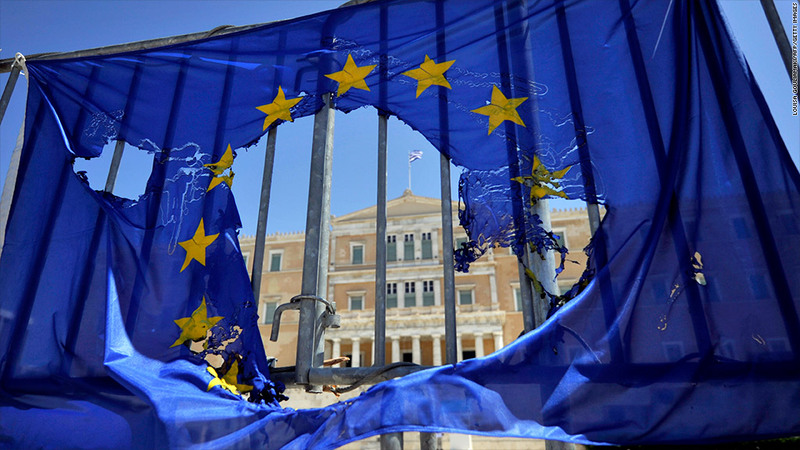 The return of political instability comes at a difficult time for Greece. There were reports this week that the IMF may not deliver its share of the next bailout payment because of a funding gap in Greece, partly due to lower-than-expected receipts from privatization. The European Commission, European Central Bank and IMF -- known as the troika -- have confirmed that a review of Greece's progress has been suspended until the end of June. Still, the troika says talks will resume at the end of the month, and bailout financing for the country should not be affected. "There is no financial gap. The [bailout] program will be fully financed," said Jeroen Dijsselbloem, who chairs meetings of eurozone finance ministers. He said the troika was under a tight deadline to finish its Greek review by the beginning of July to ensure payments were made on time. --CNN's Theodore Kermeliotis contributed to this story.